Chevron Stripes spinning around on this pinwheel bow are awesome! This bow has a black grosgrain bow on the bottom that is layered with different strips of ribbon on top. 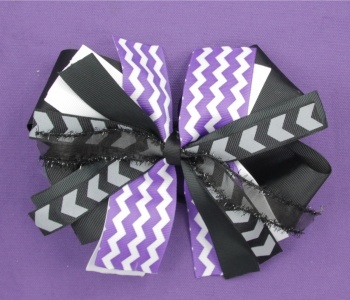 Mixed with purple and white chevron ribbon, black ribbon, and purple peace signs. This is a fun loving bow with awesome purple chevron!